Mitsubishi EngelbergTourer Concept, a modern full-electric concept SUV, will be displayed at the 2019 Geneva Motor Show. The ailing Japanese company’s first promising concept model in a long time will be a showcase of the company’s EV capabilities and could even become the base for the next generation Outlander SUV. The technical specifications of the Mitsubishi EngelbergTourer Concept will be publically announced only after it is officially displayed at this year’s Geneva Motor Show in March. Right now, the company has restricted itself to sharing a teaser image of the new model’s front-end. 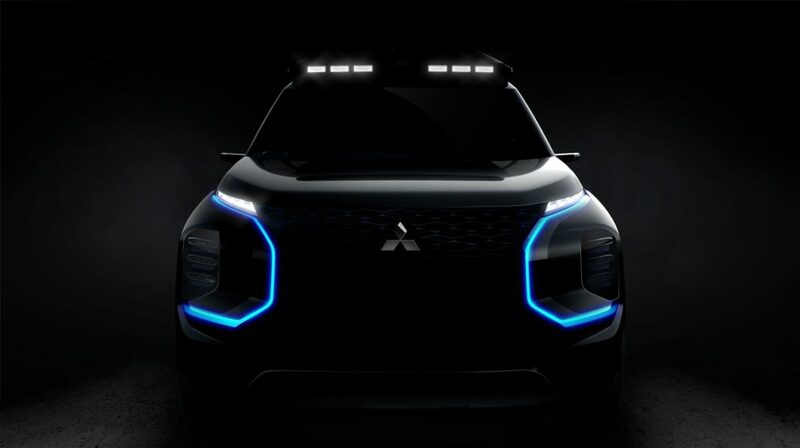 Also, the company is yet to provide any sort of hint on the parts of the design of the Mitsubishi EngelbergTourer concept that will make it to the production model. However, there are very good chances of the new model being extensively used for all the future electric products from the Japanese manufacturer. The new Mitsubishi EngelbergTourer concept can be viewed as a logical successor to the company’s e-Evolution design study that was first shown at the 2017 Tokyo Auto Show. The earlier concept carried the brand’s same dynamic shield design philosophy for the front-end. It had a blanked-off radiator grille, three electric motors, four-wheel drive, active yaw control and a torque vectoring system. In India, Mitsubishi has been struggling with a weak and dated product line up. The Pajero Sport, and especially the Montero, are dated products that have been struggling to become popular. Even the latest Outlander for India came many years after its global launch, which hints at the company’s casual approach towards a booming market like ours. In all chances, the Mitsubishi EngelbergTourer concept or its production version will never come to our shore.